HomÅ“oprophylaxis has been part of mainstream homeopathy since 1798, but its use remains controversial. Its history and evidentiary base is frequently misunderstood. This book aims to provide homeopaths, as well as practitioners of any modality and students with a complete grounding in the topic. It contains comprehensive instructions how to implement both short-term and long-term HP programs, a thorough presentation of the evidentiary base of HP as well as an in-depth discussion of its philosophical underpinnings. This is the most comprehensive resource currently available on the challenging topic of homeopathic immunisation. I chose to review the three books presented here when I realised that they formed an interesting triptych. 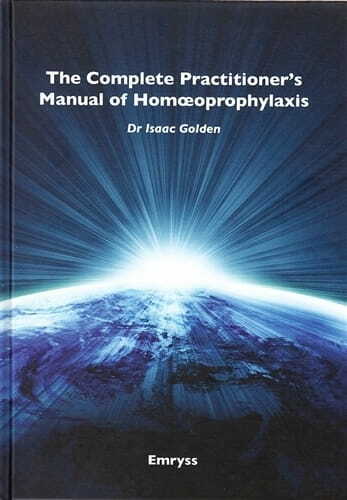 Specifically, Birch and Whatcott discuss homeoprophylaxis, vaccination and immunology in their book "The Solution" by directly utilising and referring to Golden's own work on homeoprophylaxis, which he presents in an up-to-date form in "The Complete Practitioner's Manual of Homeoprophylaxis". Birch and Whatcott also have a foreword written by Obukhanych, who has recently used her immunologist credentials to debunk the principles behind vaccination in her e-book "The Vaccine Illusion". From the outset, I would like to state that I have tremendous respect for the dedication and passion of all the authors as well as admiration for their determination to fight for something they believe in, no matter how unpopular or vilified it may make them. For this courage I acknowledge each of them in turn. Of the three authors Golden's voice was the most measured, considered and thoughtful. Golden seemed to ce a strong proponent of freedom of choice, unlike the 3ther two books which had more of a clear agenda. In stark contrast to Golden's style, Birch and Whatcott switch throughout their book between personal passion and -onsensical phrases, via attempts at providing evidence and scientific information about a wide range of topics all in a 'coffee table' style book. The first half of the book is ittered with typing errors (like using "recumbent technology" instead of "recombinant technology") that sometimes rendered the sentence meaningless. These odd sentences, of which there are many more examples, appear to be made up of mostly the right words, but the meaning has been rendered hazy. Obukhanych, on the other hand, utilised an entirely different writing style to Golden and Birch and Whatcott. Her chapters are short and punchy like a lawyer presenting a case against all immunologists, but the chapters were also sprinkled with slightly sarcastic and occasionally vitriolic half sentences. For me this presented an uncomfortable conflict between the evidence that Obukhanych used to support her case and a sense that her points were motivated more by emotion. I felt that I was reading a book written by an angry and wronged woman who was using her scientific pedigree to support her emotive case against Immunology. As a fellow immunologist I wanted to like her and get behind what she wanted to say, but in the end I didn't because my experience and understanding of immunology was vastly different. Following from this, the application of immunological science in each book raised further issues for me. In my experience, immunology is a complex and dynamic network of multi- dimensional interactions between molecules, cells, micro-organisms, evolution, ethnicity and susceptibility. Admittedly, the applications of immunology at the bed-side are always years behind immunological research. In this way I certainly agree with Obukhanych (as stated both in her e-book and in the foreword she provided for 'The Solution') that the principles of vaccination are based on a relatively gross level of understanding of the immune system and may well represent a premature application of a bench-to-bedside tool. There is certainly scope for generating working hypotheses on how vaccines could contribute to the development of allergy and auto-immune disorders. Obukhanych begins to do this in 'The Vaccine Illusion' but fails to follow through adequately. In chapters 5, 6 and 10 she presents a theory of how vaccine antigen type, adjuvant use, immunological memory and antibody production are linked in the establishment of allergy. I am not at all sure that I understand her reasoning as she appears to be proposing a complex model based on a series of ideas and observed phenomena rather than solid evidence. Further, given that Obukhanych provided a foreword to 'The Solution' and that the book was allegedly read by a homeopath experienced in immunology, amongst other people, I was disappointed in the quality of the immunological information presented. The 'How the Immune System Works' chapter is bitty, inconsistent and with an unclear purpose. In contrast to both Obukhanych and Birch and Whatcott, Golden uses very little reference to immunology in his book. This was perhaps a wise decision; although I felt it would have added strength to his thesis if he had. Instead, in section 8, Golden proposes mechanisms of homeoprophylaxis action, discussing a proving-like model versus an energetic model. To my mind there is plenty of information available that could allow Golden to propose a working hypothesis based on recent theories and experimental data around ultra-high dilution preparations Chikramane 2010, 2012; Van Wassenhoven, 2012). How do these advances in the basic homeopathic research affect Golden's work? The recent nanostructure theory (Bell and Koithan, 2012) suggests the physical presence of antigenic substances in homeoprophylactic nosodes that could stimulate a specific or innate immune response at some level. Distinct from Golden's discussion of removal of susceptibility to infection in the vital force within his homeoprophylaxis program, both Obukhanych and Birch and Whatcott tackle susceptibility in relation to infectious processes and vaccination. Sadly, Birch and Whatcott present an inconsistent and overly simplified series of points about susceptibility, sometimes contradicting themselves. As with any discussion of medical issues accurate, appropriate and proportionate use of references is paramount to supporting the arguments made by authors. Unfortunately, this aspect of Birch and Whatcott's book was severely lacking, Obukhanych's use of references was unusual and very focused, while, in contrast, Golden utilised his references with academic rigour. Birch and Whatcott made some key and bold statements that were left unsupported by any reference source. The sections in Golden's manual where he discusses the history and evidence for homeoprophylaxis are coherent and compelling. Golden presents a good discussion of the leptospirosis paper (Bracho et al, 2010), which is widely held as very strong proof of concept for homeoprophylaxis. However, it is important to remember that Golden's long-term homeoprophylactic program covers 'usual' infections while many of the external papers on homeoprophylaxis cover unusual infectious agents and specific conditions. That is, the success of a leptospirosis nosode combination remedy in an epidemic outbreak of an endemic zoonotic infection in Cuba does not mean that all homeoprophylactic nosodes are effective. Interestingly, Golden tackles Birch and Whatcott's claims specifically in his book and he states that in his opinion homeoprophylaxis almost certainly does not result in antibody production, as it does not work like vaccination. In his experience, tests of antibody levels do not help determine if homeoprophylaxis is working and that any claim homeoprophylaxis makes or works via antibody lays it open to attack by conventional science and medicine. One of my main concerns about Golden's homeoprophylactic program, and I admit this may simply come from my own limited clinical experience, is how parents and homeopaths not specialised in homeoprophylaxis can measure 'success' of the program in terms of remedy responses. 'Success' can only be determined retrospectively and clinically over many years. From Golden's data there appears to be about a 2% rate of reactions per dose in the long-term program. This means that 98% of doses given will not manifest an obvious response, so, on a small scale in a non-specialised clinic we would be essentially working in the dark. and vaccination, as well as a 'Quick Guide to Homeopathic Treatment' where many vaccine-preventable infectious diseases are briefly presented and remedy possibilities suggested. Obukhanych also provides her own practical advice about eating a natural diet and uses biochemical explanations to support her argument. In chapter 13, Obukhanych introduces the idea that homeopathy is better than Tylenol to treat fevers and again, uses biochemistry to explain her answer. This is the only mention of homeopathy in her book. In summary, Golden's manual is a superbly written reference book to keep and re-read. He focuses on calmly presenting and considering what he has learned about long- and short-term homeoprophylaxis. I felt the weakest parts of his book were the minimal discussion of immunology and his discussion on the possible mechanistic models of homeoprophylaxis. Obukhanych's 'The Vaccine Illusion' sadly does not fill this immunology gap: I felt she could have put her research pedigree to much better use and developed her theories more fully instead of taking an aggressive tone to challenge the central scientific approach to vaccination. There is much in her book that acts as food for thought, and in this sense it is worth reading. Overall, I wish Birch and Whatcott's book had been better, as their intentions were nothing but good. I found their presentation too inconsistent to be informative, although they do bravely try to tackle all three legs of this very unstable stool. Finally, there is no denying that all aspects of the vaccination debate are difficult and complex when taken individually, never mind when taken together. Because of this, I do not want to undermine anybody's efforts to bring about change in the world for the better especially where children's health is concerned. I strongly advocate reading these books for yourself and questioning them all.